Last fall Virginia Farm Bureau Women’s Committee Chair Janice Burton issued a challenge to each women’s committee district to increase their activity during the 2012 General Assembly. For the district that made the most legislative contacts, Janice would donate $500 to Agriculture in the Classroom. 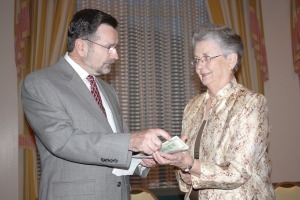 President Wayne Pryor offered to match Janice’s contribution for a grand total of $1,000. President Pryor and Janice made good on their promise at the 2012 VFB Women’s Conference held last weekend at the Homestead. Overall, members of the state women’s committee made 2,292 legislative contacts this session. The Southwest District, which includes Smyth, Lee, Russell, Tazewell, Wythe, Washington, Bland and Wise-Dickinson counties, made the most contacts with 1,361. Great job, ladies! And thanks to Janice and President Pryor for their generous incentives! We here in Governmental Relations can’t stress enough the importance of contacting your legislators about bills or issues affecting Virginia agriculture, especially at crucial voting times. If you are a producer member and would like to receive our Action Alerts, please email kelly.pruitt@vafb.com.